Derby cocktail. Photo by Donna Turner Ruhlman. I’m on my annual foray to my beloved mom’s in West Palm Beach and enjoying blue sky, blue water, and lazy days, so here this repost from 10/4/13 of an overlooked but most excellent cocktail.—M.R. When I opened to the Cleveland Plain Dealer‘s wonderful and expanded food section, I was delighted to find a handful of bartenders offering cocktails. The Derby, offered by Lindsey Hawes, who mixes drinks at The Willeyville in the Cleveland Flats, caught my eye (here she is making another fave of mine, The Dark & Stormy). The Derby caught my eye for its straightforwardness and lack of frou. I immediately thought of the Brown Derby, a restaurant chain that flourished here in the 1970s, where I first encountered what was called a salad bar, back in the pre-sneeze guard days (God, how I long for the simpler times when people didn’t freak out about bacteria and rub sanitizing gel on their hands every five minutes). Potatoes came foil wrapped (an actual botulism worry, in fact). Butter was all but frozen in foil packets, and the onion rings adorning the filet mignons came out of a plastic bag. How I loved going to the Brown Derby with my mom and dad, Uncle Jon, and Aunt Barb. I don’t know the provenance of this cocktail, though Leite’s Culinaria traces it to the 1940s and Trader Vic. But I love it for its bourbon wallop, the sweet vermouth, orange liqueur, and sharp lime juice, with a light aromatic mintiness lingering on the tongue. Mint can be used in the garnish only or muddled delicately in the shaker (but not pulverized—no shreds of leaf should be in the pour). A lovely fall cocktail as the evenings grow cooler. I used a new bourbon I’d been meaning to try, shipped in to Cleveland and then rapidly aged using a new speed-aging technique. It’s not Blanton’s or Woodford, but it’s pretty damn good and perfect for this cocktail. 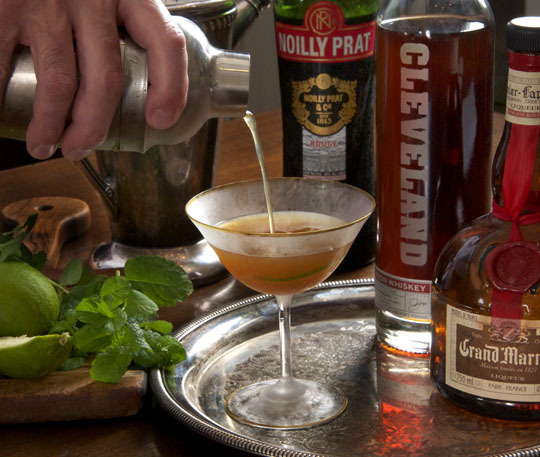 Fill a cocktail shaker with the bourbon, sweet vermouth, Grand Marnier, and lime juice. Muddle some mint in it gently if you wish. Add ice and stir for 90 seconds or so. Strain the concoction into a chilled coupe. Garnish with the lime wedge and mint leaf. Other cocktails featuring bourbon: the classic Manhattan, the Mint Julep, and the Boulevardier. Headed South? Then visit the bourbon trail in Kentucky. What makes a bourbon bourbon? © 2015 Michael Ruhlman. Photo © 2015 Donna Turner Ruhlman. All rights reserved. I like this one in segments. The first being the Manhattan, next being the mint julep, but the margarita needs to stay out of my bourbon. I’ll make whatever the guest wants, but I’m not joining in on this concoction as a whole. Two great cocktails in there. Three if you have tequila. So three cheers for Friday!!! Die hard manhattan fans. Tasting the derby the first time post exceptional meal. Both agree… Very tasty! Almost whiskey sour-y (vtr always!) But more stiff and bold. Thank ya! speed aging = wood chips, no?